If you haven’t checked out Snooth before, you really should. 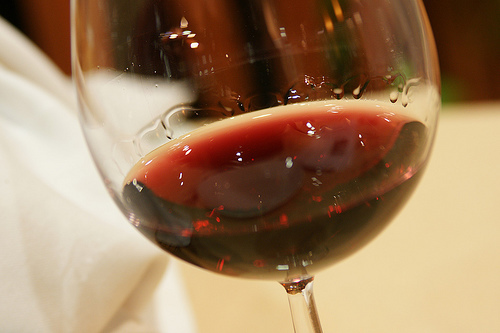 They’ve got tons of great wine education, plus ratings, plus a very active forum and more. I’ve been following since they got started in 2007 and it just gets better and better. Cheers! Refractometer? Yup. It plays a very important role, now, as harvest approaches because it measures the sugar in the grapes. 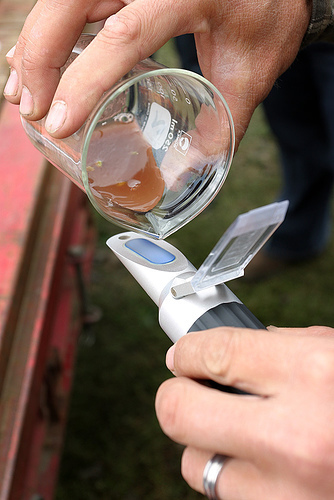 The refractometer is a really nifty little instrument because it gives the winemaker an instant sugar reading. It’s kind of like a prism and measures the soluble solids in the grape juice. All you have to do is squeeze a little juice onto the lens of the refractometer. When you hold it up to the light it measures how much the light bends as it passes through the liquid. The denser the liquid, the more the light bends and the higher the reading will be (about 90% of the soluble solids is sugar). Why is the sugar so important? It determines the alcohol. The winemaker can assume that a little over half of the sugar measured at harvest will result in alcohol in the finished, dry wine. So, if the grape sample measures 25% sugar the wine will be in the ballpark of 13.5 – 14% alcohol. Incidentally, the degrees Brix, another wine word, translates to the percentage of sugar. 25 degrees brix = 25% sugar. So, you got a two-fer!